This meal was a filling and perfectly delicious fall dinner offering from The Scramble*. My boys gobbled up the chicken and asked for seconds. The four-year-old LOVED the Brussels sprouts. In fact, after feasting on these roasted delights he asked that we bring Brussels sprouts for his healthy snack at preschool this week! I almost laughed out loud, but instantly agreed. Now I don’t know whether I should actually roast them and bring Brussels sprouts or push back and pick something more palatable to four-year-old humans for a 10:00 a.m. snack! Any suggestions? I have to admit that I felt my chicken was just the tiniest bit over cooked. I’d caution you to watch carefully when you return the chicken to the skillet with the mushrooms. Don’t let it simmer too long. Here’s to healthy eats, and making it halfway through the week! 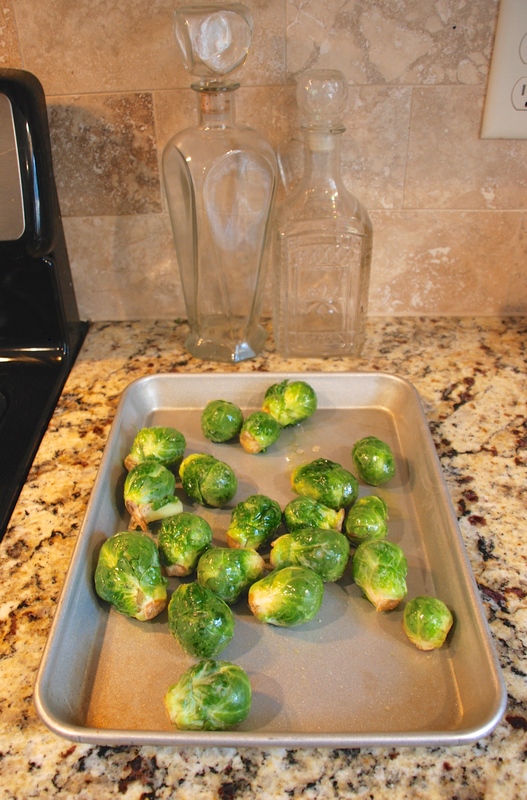 Start the Brussels sprouts first, if you are serving them. Preheat oven to 450. In a small bowl, toss clean Brussels sprouts with 1 Tbsp. olive oil, salt and pepper to taste. Turn out onto a baking sheet. Roast for 25-30 minutes. Turning occasionally. In a medium bowl, combine the flour, salt and pepper. Add the diced chicken and toss it gently to coat. Heat a large heavy skillet over medium heat. Add 1 Tbsp. oil and the butter and let the butter melt. 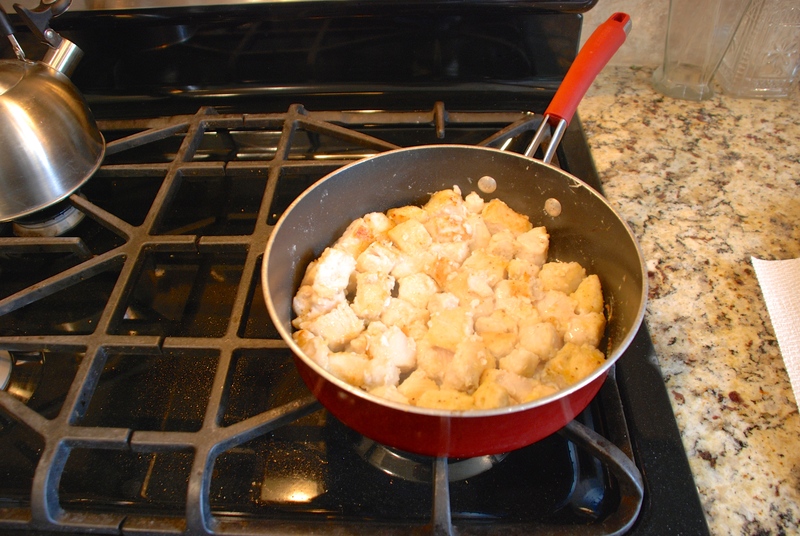 Place the chicken in the skillet and cook it on each side until it is browned and cooked partially through. Around 6 – 8 minutes total. Transfer the chicken to a clean plate and set it aside. Put the remaining oil to the same pan without cleaning it. 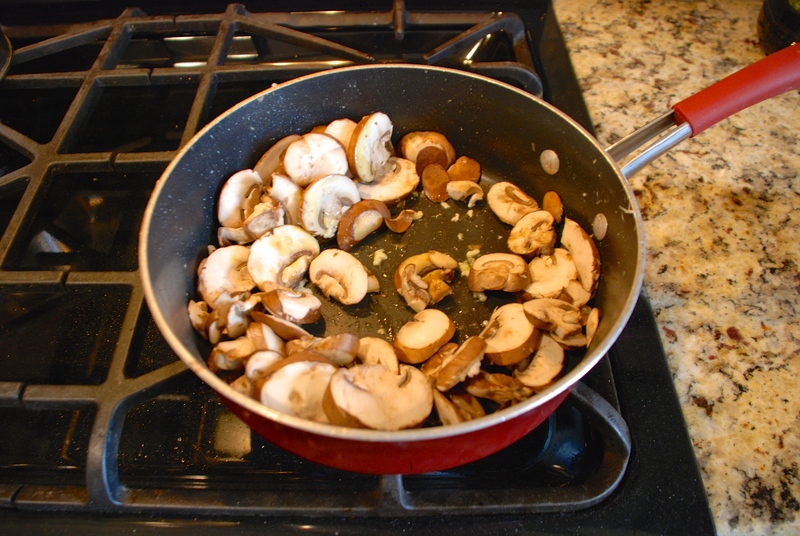 Sauté the mushrooms and garlic for 1 minute, and then add the wine, broth and lemon juice. Bring the liquid to a low boil, scraping any bits of chicken from the bottom of the pan. 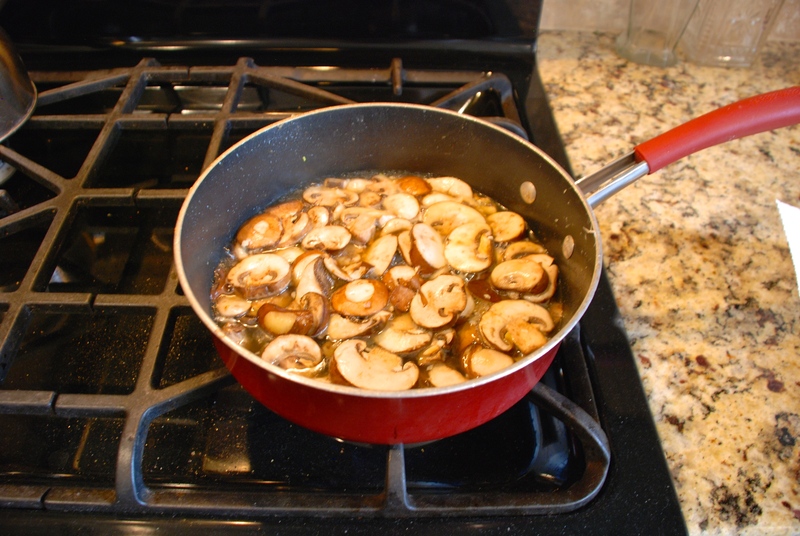 Simmer the mixture for 10 minutes until the mushrooms are tender and the liquid is reduced and slightly thickened. Add the chicken back into the pan, spooning the sauce over it, and cook it for 3 – 5 more minutes until the chicken is just cooked through. 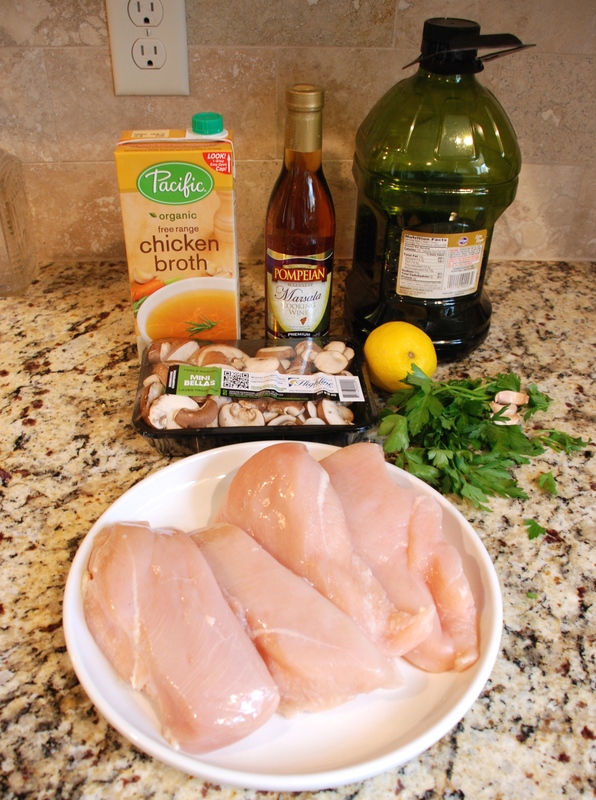 Season it with additional salt, if desired, and sprinkle the chicken with parsley before serving. 1. Brussels Sprouts begin this meal. Preheat oven to 450. Roast for 25-30 minutes. 2. 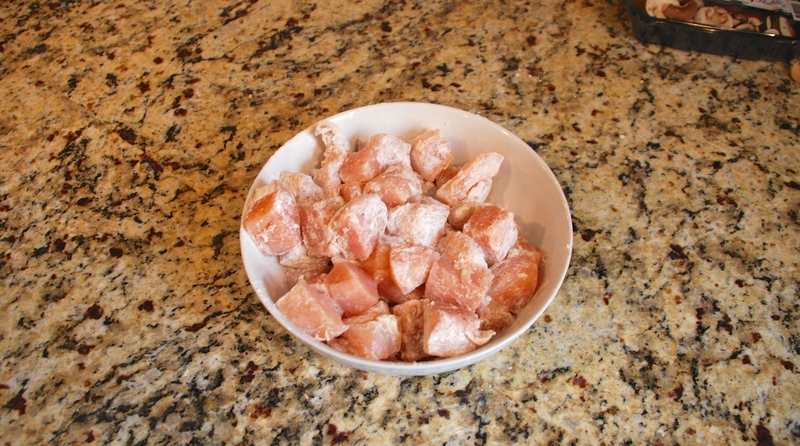 Toss the diced chicken in flour, salt and pepper. 3. Cook the chick for 6-8 minutes until it browns on each side. 4. Remove the chicken to a clean plate. Add additional oil to the skillet (no need to wash clean). Then place mushrooms and garlic in the skillet and sauté for 1-2 minutes. 5. Add the wine, broth and lemon juice. Bring to a boil, then lower the heat to simmer for 10 minutes until the mushrooms are tender. 6. 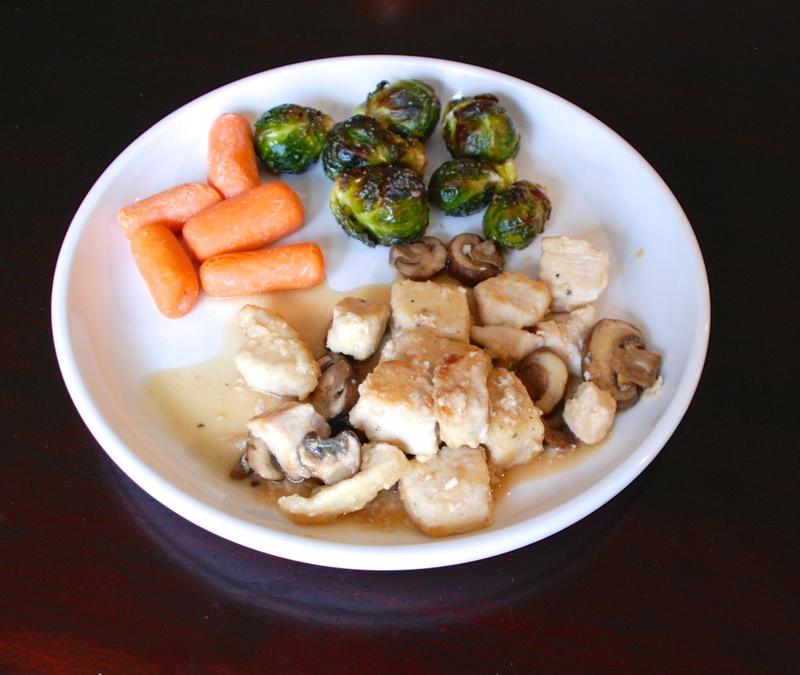 Return the chicken to the skillet and simmer for another 3-5 minutes until flavors are well meshed. 7. 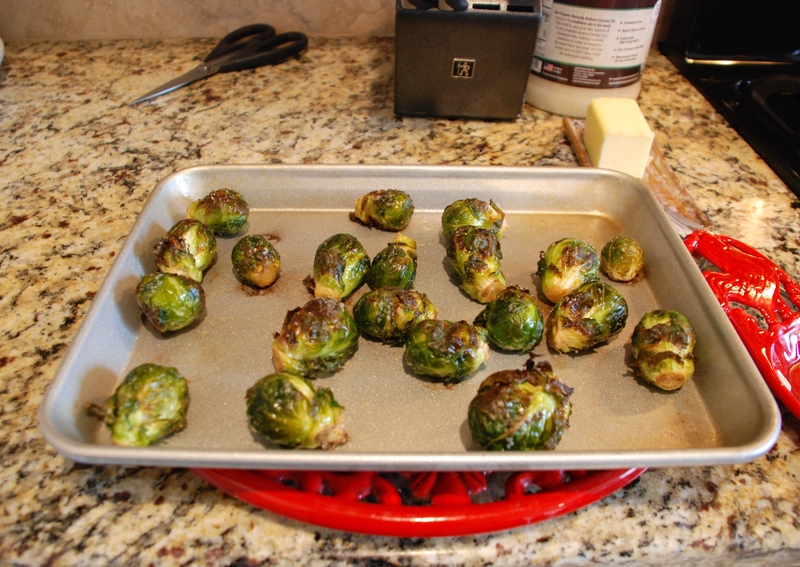 Remove the Brussels sprouts from the oven. Plate and EAT!!! < Vintage Puffer and Plaid FTW!